The Hangar 9 Van’s RV-4 30cc ARF features superb detail, including cockpit, figure, landing lights all covered in UltraCote. Equip it with electric, gasoline or glow power plants for outstanding flight performance. Among the hundreds of homebuilt aircraft designs that have taken flight over the years, few inspire pilot devotion like the Van's RV line of airplanes. Just ask any of the faithful. It doesn't matter which RV they fly. They will all testify to a balance of stability and nimble response that just makes you want to smile whenever you're at the controls. Master model designer, Ali Machinchy, has perfectly captured that Van's experience with this 30cc reproduction of the RV-4. It combines superb detail and thrilling flight performance to give pilots of almost any skill level a giant-scale experience unlike any other. The Hangar 9® Van's RV-4 30cc ARF has been designed to make every step of your giant-scale experience as hassle-free as possible. It all starts with the assembly. The two-piece plug-in wing and horizontal stabilizer slide together on aluminum tubes and bolt into place. The large fuselage access hatch makes electronics installation easy, too. There's even a pre-assembled, self-aligning drill guide to speed the installation of whatever powerplant you decide to use, gas or electric. Once in the air, you'll find the model's wide flight envelope and forgiving flight characteristics just as easy to enjoy. 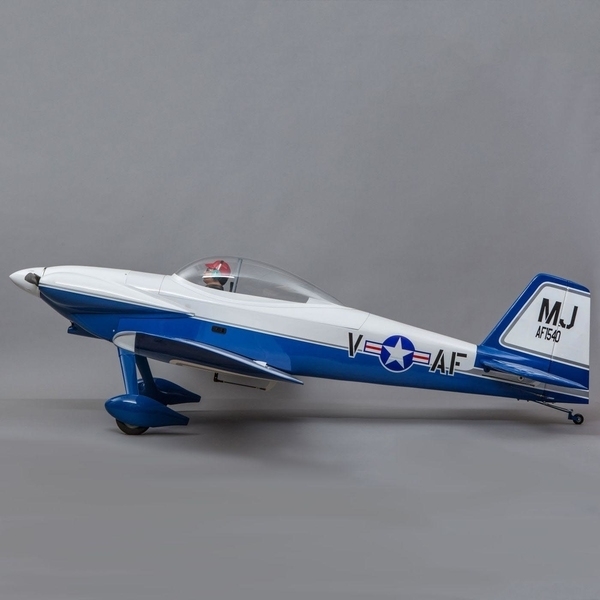 It will do it all, from touch and gos to advanced aerobatics, with the same smooth, predictable response the full-scale version is famous for. Lightweight, laser-cut balsa and plywood construction is utilized to bring the Van's RV-4 30cc to life as a durable scale model that's expertly built to exacting standards. Genuine Hangar 9 UltraCote® covering provides an easy-to-maintain finish you can customize with either a military-style or civilian look using the decal sheet provided. Beyond the pilot figure, cockpit, pre-installed landing lights and other scale details, the complete Van's experience shines through in the air too with functional flaps that help widen the flight envelope whether performing slow flight or advanced aerobatics. Both the wing and horizontal stabilizer are two-piece and plug-in with aluminum tube support, making storage, transport and assembly easy. The large top-hatch makes access to the internal components, like the flight battery or fuel tank, as simple as possible. The Van's RV-4 30cc is designed to accept a variety of gas engine or brushless electric powerplants. Hardware for both options is included along with an electric motor mount and a self-aligning drill guide so you can get in the air faster.